Continuing a recent string of articles on unmanned air vehicles, this month's US Naval Institute's Proceedings features an article (membership required) by CDR Rich Lebron, Commanding Officer of the destroyer USS Benfold (DDG-65) and two other officers in his wardroom. The piece highlights recent at-sea testing of the Puma AE small tactical unmanned aerial system onboard Benfold last year. The article discusses the utility that even a short-range, hand-launched UAV can bring to a surface combatant. 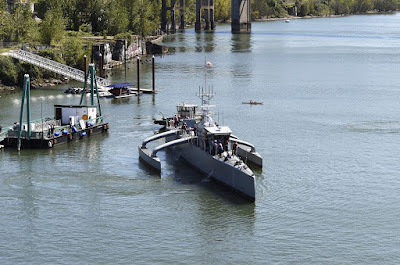 Benfold tested the Puma off the California Coast against simulated small boat attacks and to monitor a visit, board, search, and seizure (VBSS) exercise with similar results. Lebron et al conclude that despite range limitations, the Puma is quite suitable for use by independent steaming surface combatants such as Benfold, which usually operates without external support on long duration ballistic-missile-defense missions. It is affordable, requires no additional crew, little additional training, and provides a much-needed aerial surveillance capability for Flight I Arleigh Burke destroyers that normally don't embark helicopters. Benfold's Puma testing follows additional at-sea demonstrations of the UAS in the Middle East and Western Pacific the past few years. 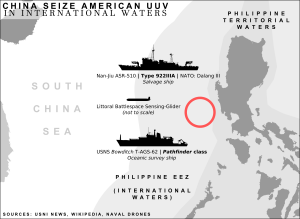 Given this amount of operational validation, it's time for the Navy to decide whether or not to make a minimal investment to provide its non-helicopter equipped ships an organic aerial intelligence, surveillance, and reconaissance capability. In the gulf of Mexico, some beach goers mistake them for UFO saucers. It's just that some are not aware of the military drone testing by the navy and the light does alter its shape in the horizon.